If you have already contacted the Commissioner and would like to check the status of your request, click here. Please use this form to write to DOT with your transportation-related issues. 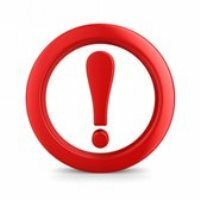 You will not be able to check the status of a 311 Service Request on this page. If you have submitted a 311 Service Request and would like to check the status, please click here. Please contact 311 online to report a signal or streetlight that is out. Please contact the MTA for issues with the subway, buses or commuter rail. Please contact the Police Department for issues with traffic enforcement agents or towed vehicles. Please contact the Department of Finance for assistance with parking tickets and camera violations. DOT does not install Speed Reducers near fire houses, hospital emergency entrances or where there is more than one moving lane in each direction. If you would like to report a pothole, please use the dedicated form. Report a pothole. How do you want to describe the location? You must select a borough. A segment is a stretch of street, like Fifth Avenue between 42nd and 43rd Streets. Where and When on the Staten Island Ferry? It might take some time to load cases. In order for us to fully address your concern, you must provide as many details as possible in the box below. Please be sure to include dates and time and the direction of travel as it relates to your concern. Include the basis for your complaint, as well as details such as names, witnesses and specific dates and times. A New York City Department of Transportation staff will contact you promptly. Sign up for email list. Be the first to know about BQE project announcements, new meetings, and other ways to be involved. If you have a case number, please include it in the description. Please be advised that if you chose to be Anonymous, we may be unable to complete your request if additional information is required, and you will not be receiving any responses from DOT regarding the status of your request. Please select option to proceed. 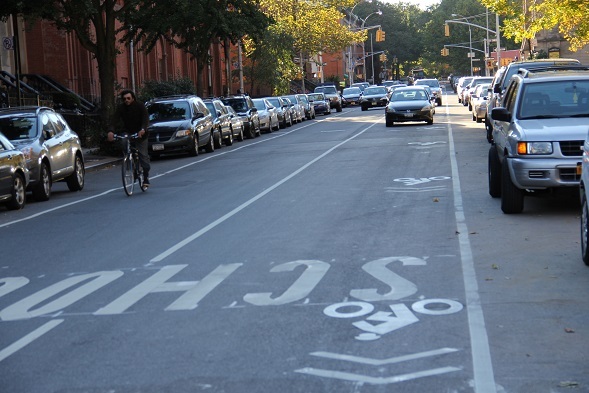 A Speed Reducer is a type of physical traffic calming device used by NYC DOT to lower the speed of motor vehicles along specific street segments. Speed Reducers are constructed from asphalt at a height of either 3 or 4 inches, and are accompanied by warning signs and roadway markings. Click here to read more about Speed Reducers. In order to effectively process your request, please answer the following questions. Is this block on a bus route? Is this block on a truck route? 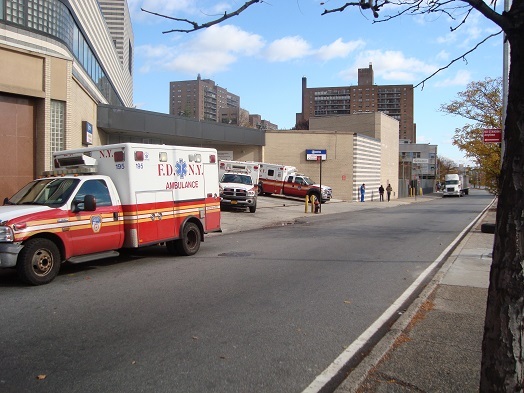 Is there a Hospital or Emergency Medical Facility on the block? Is there a Firehouse entrance on the block? Is there more than one lane of traffic traveling in either direction? Based on your previous answers, this location DOES NOT meet the engineering requirements for a Speed Reducer. However, DOT is committed to addressing your concerns. Please provide as much information as possible on the DOT webform in the 'Describe your Concern' section. Based upon your answers, it appears that this location may meet the initial criteria for a Speed Reducer. DOT only installs Speed Reducers on street segments which meet a set of engineering requirements. Click here to read more about Speed Reducers. Once DOT confirms that this location meets the initial criteria for a Speed Reducer, DOT will commence a full Speed Reducer study. 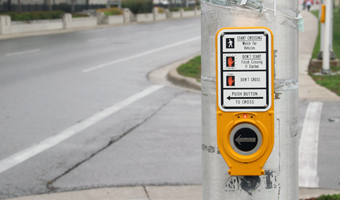 Accessible Pedestrian Signals (APS's) have both an audible walk indication and tactile arrows on the pushbuttons that vibrate during the walk interval to assist visually impaired pedestrians to cross the street at signalized locations. DOT works closely with the Mayor's Office of People with Disabilities (MOPD) and Pedestrians for Accessible and Safer Streets (PASS), a coalition group representing the visually impaired, to identify locations where APS's are feasible. Due to a large volume of requests and types of studies, the timeframe to complete a study varies and may take from four to seven months. The Borough Commissioner will notify you of the results at that time. 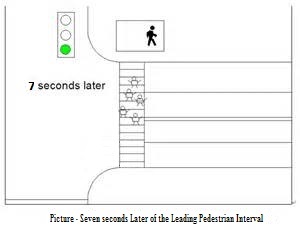 Leading Pedestrian Intervals (LPI's) provide an exclusive "Walk" period at the start of the signal phase to give pedestrians a head start to begin crossing the street prior to the parallel movement of traffic getting a green indication. DOT installs LPI's at signalized intersections throughout the city where our traffic engineers have determined that they are warranted. Due to a large volume of requests and types of studies, the timeframe to complete a study varies and may take from four to seven months. The Borough Commissioner will notify you of the results when the study is completed. *To thoroughly investigate your request, you must provide specific directional information in the "Describe your concern" field on the main webform as it relates to your concern. 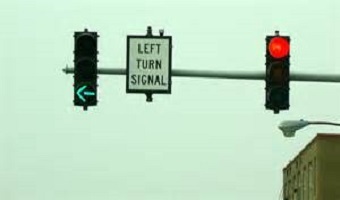 Left turn arrows are installed at signalized intersections for drivers to make an exclusive left turn while opposing traffic has the red signal. Left turn studies are usually completed in 6 months. The Borough Commissioner will notify you of the results when the study is completed. Multi-Way Stop signs are installed after DOT completes an engineering study at intersections that already have a stop sign installed in one direction. They force all motorists, pedestrians and bicyclists to stop at the intersection before proceeding. Due to a large volume of requests and types of studies, the timeframe to complete a study varies and may take from four to seven months. The Borough Commissioner will advise you of the results when the study is completed. An intersection control study is conducted for a new signal request to determine if additional traffic control measures are warranted at a location. 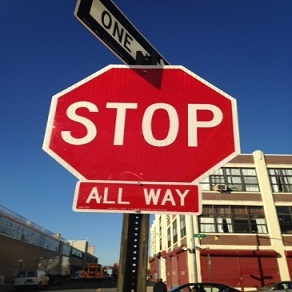 The latest edition of the MUTCD lists nine conditions (or "warrants") for DOT to consider. (To learn more about the MUTCD requirements, please visit: MUTCD on the FHWA website). Some of the data collected are pedestrian and vehicular volumes, crash reports and geometric characteristics of the location. Due to a large volume of requests and types of studies, the timeframe to complete a study varies and may take from four to seven months. The Borough Commissioner will advise you of the results when the study is completed. Pedestrian Countdown Signals (PCS's) display to the pedestrians the number of seconds remaining to cross the street safely while traffic is stopped. 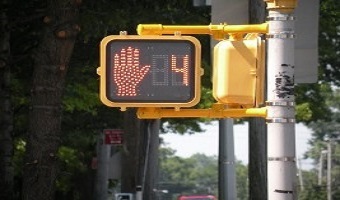 An intersection control study is conducted to determine if Pedestrian Countdown Signals are appropriate for a location. Due to a large volume of requests and types of studies, the timeframe to complete a study varies and may take from four to seven months. The Borough Commissioner will advise you of the results when the study is completed. ALERT:Please call 311.This is not the correct form to report a signal defect. 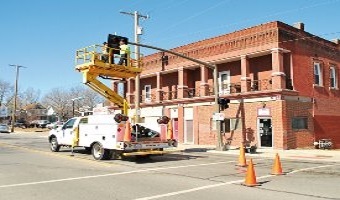 DOT's contractors are required to arrive at the scene of the most serious problems (e.g., all lights out, or a knocked-down pole) within two hours of notification. If a bulb is out, contractors are required to respond within 48 hours. Signal Timing cycle lengths (the time required for one complete sequence of signal indications) usually fall between 60 and 150 seconds. The timing plan for each signal is determined based on traffic volumes and traffic patterns of the location. If you believe the timing of a movement or pedestrian crossing needs to be changed, DOT will investigate to determine if an adjustment in the signal timing is needed. Due to a large volume of requests and types of studies, the timeframe to complete a study varies and may take from four to seven months. The Borough Commissioner will advise you of our findings when the study is completed. ALERT:If you are concerned about speeding please provide as much detail regarding the speeding problem in the Details section of the form so that we may determine the appropriate course of action. For immediate concerns regarding speeding, please contact your Local Precinct. A traffic signal may not be the best solution for the concern you are reporting. 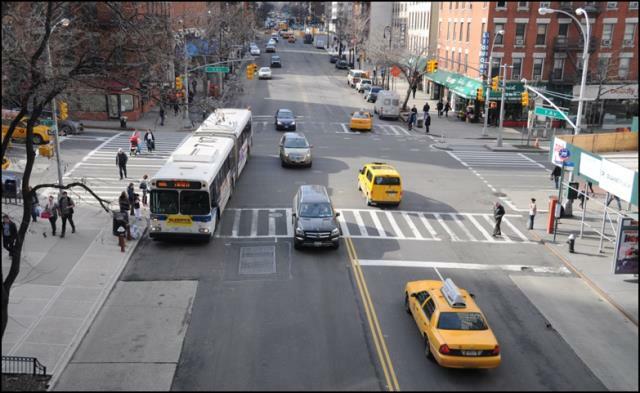 More information on DOT's Pedestrian Safety Initiatives can be found here. 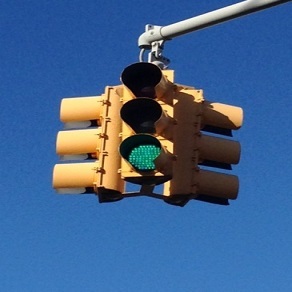 DOT will perform an intersection control study of traffic conditions at a requested location to determine if the removal or relocation of traffic signals are warranted. Due to a large volume of requests and types of studies, the timeframe to complete a study varies and may take from four to seven months. The Borough Commissioner will advise you of our findings when the study is completed. Please select direction to proceed. Please select Day of Week Option(s) to proceed. Please select Time of Day Option(s) to proceed. Alert: This is not the correct form to report a damaged, dangling or missing completely sign. Please click here to submit your request/concern. The MTA is best suited to address your comment. The MTA operates all transit service, while NYC DOT is making improvements to street and sidewalk space to keep transit moving during the L Train shutdown. You may reach the MTA by calling 511; visiting MTA Website; or writing to MTA New York City Transit: Andy Byford, President, 2 Broadway, New York NY 10004. The NYC Department of Transportation (DOT) receives numerous requests for installation of Speed Reducers in all parts of the city. DOT conducts a comprehensive examination of each Speed Reducer request, including an analysis of vehicular speeds, pedestrian and motorist observations, roadway geometry and land use. Speed Reducers may not be installed on blocks that have a Fire Department house or hospital emergency entrance or have more than one moving lane in each direction. Due to the widespread interest in these traffic calming devices, it may take up to two years for a study to be completed. In the interim, please report any illegal speeding directly to your local precinct for increased enforcement. Please visit this link to find your local precinct: NYPD Precinct Contact Information. 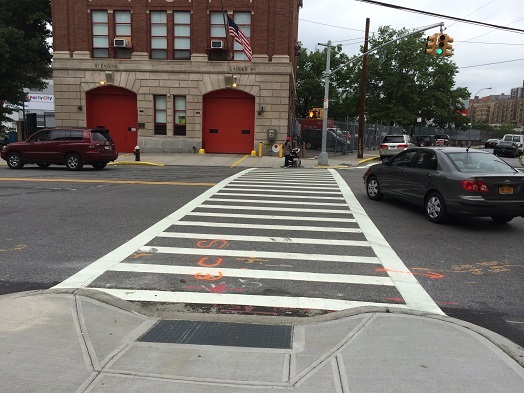 For more information about Speed Reducers, click here NYCDOT- Traffic Calming Devices - Speed Reducers . What is the L Train Shutdown? For 15 months starting in April of 2019, all L train service will be suspended across the East River and within Manhattan to repair damage caused by Superstorm Sandy. The L train will still run within Brooklyn, serving all stops. All alternative travel services, infrastructure and policies are temporary for the duration of the L train closure. Full details are available at Service during tunnel reconstruction. New York City Department of Transportation (NYCDOT) is in the early phases of its proposed reconstruction of the 80-year old section of the BQE that extends from the Atlantic Avenue interchange to the vicinity of Sands Street, and includes the triple cantilever structure, which carries two levels of traffic and the Brooklyn Promenade. This reconstruction project will address any existing structural deterioration, as well as improve the geometry of the highway with improved lane widths, truck clearances, and ramp design. Full details are available on BQE Project Overview page. I have read this message and understand the process. You can check the map to see if your issue is already being addressed. It is easier to FOLLOW an existing case instead of submitting a new one. Thanks for taking the time to write. Your case number is . If you write to DOT on this case in the future, please include this case number. I'm sorry, there was an error submitting your request. Please make sure all required fields are filled out and try again.